There have been kiddush clubs in shuls for as long as there have been shuls. Making a "l'chaim" after davening is one of the unique aspects of Judaism; our belief that the mundane parts of life can be elevated to a higher status through prayer is one of the central parts of our faith. We eat, sleep, drink, etc. with a blessing. The blessing makes the action holy, not just through making it, but also through the reflection one gets from pausing before the act to stop and make the blessing. We think about what we are going to do and we have the intention to perform the act after a religious moment. We bring holiness to these acts through the blessing, through the thought and through our commitment. Judaism has no prohibition on alcoholic beverages, in fact, one of our most important and sacred acts is to consecrate shabbat and holidays with the kiddush (blessing) over wine. If proper wine is not available, any kosher alcohol or juice may be substituted. It's not about the drink, it's about the kiddush. It's also customary to refrain from eating before the morning prayers each day. On the 6 days that work is normally permitted, the Shacarit (morning) service takes less than an hour. In my shul, if the cantor is davening, it can sometimes be done in 32 minutes including Torah reading. (We read 3 short portions on Monday & Thursday mornings) On Shabbat and holidays, we have an extra service, Musaf, which takes place after a longer Torah reading and the Haftorah, a selection from the prophets which is read each week. For more information about the weekly Haftorah, sign up for The Unraveller, an e-newsletter from the FJMC. It's not unusual for the entire service to take between 2 or 3 hours from "opening baruch" to the big finish. Kiddush clubs (sometimes called "Key" clubs) meet any time after Shacarit, after the Torah reading, before the Haftorah, after the Haftorah, before the sermon, after the sermon. There is no fixed time, just custom in each shul. A quick l'chaim, a little shmaltz herring on a TamTam, maybe some smoked fish or more. Then back to the service and Musaf, refreshed, well fed and ready. In July of 2001, the FJMC held it's first weekend convention in Toronto, Canada. Previously the conventions had taken place in Catskill and Poconos resorts and went from Sunday to Thursday. The 2001 convention began on Wednesday and ended on Sunday, so, for the first time Shabbat was part of the convention. During one of the "pre-convention" meetings with the hotel, the convention chairman, Tom Sudow (6) and FJMC president Len Gimble spent Shabbat morning at the Beth Emeth Bais Yehuda Synagogue where I was Brotherhood president at the time. After Lenny got his aliyah, the BEBY Kiddush Club Supreme Leader, Barney "Zelig" Barenholtz Z'L, invited us down to the Kiddush Club for some libation, etc. Tom had some experience with kiddush clubs in Cleveland where he lives, but Lenny had no idea of what was going to happen. We sat down at a table and our drinks were poured. Scotch all round, and in the "BEBY standard" 8 oz cup. There was herring and smoked carp on the table, and Tom and Lenny were very happy campers. Then the cholent arrived. It was like the the doors to the Olam Habah had opened. Tom looked at Lenny and said (or it might have been Lenny looking at Tom, we had had a good bit of our l'chaim by then) "we've got to have this at the convention." Fast forward to May of 2001, and I was the first "local coordinator" for the FJMC, arranging for all the incidentals and requirements of the convention. Remembering the request for a kiddush club, I sent out an e-mail asking for donations of liquid refreshment and other items for the Shabbat at the hotel. The response was incredible! We had immediate donations of about 10 bottles and Barney Barenholtz gave us a case (4 gallons!) of herring and 2 cases (24 boxes) of Tam Tams. Tom Sudow had the herring in his room the night before, bringing new meaning to "sleeping with the fishies." Sussman and I joined Tom for some of the shomer duty, and we were joined by our good friend Johnny Walker. After the border crossing incident, we gathered at the back of the room during the Torah reading and quietly made our l'chaims, had a shtickle of herring and went on to pelt the incoming FJMC president with candy to celebrate his bar mitzvah. Everyone enjoyed the event and it immediately became an instant tradition. Well almost everyone. In some bizarre rule of the universe, if 99% of the population is enjoying something, 1% shall find it an offense and seek to shut it down. Don't ask why, it's the 614th commandment. They complained. The next convention was planned for Ft. Lauderdale, Florida, in July of 2003. During one of the site visits to the hotel, Bernie Cohen Z"L, our Convention Operations Manager, asked the hotel staff to make sure that a table would be set up on Saturday morning in the same room as we were to hold services for the kiddush club to meet at. The hotel staff inquired as to the meaning of kiddush club, and when told it involved alcohol, they just about had kittens. Florida it would seem has very strict liquor laws (like only being able to serve alcohol while wearing a bikini and every drink must have a little umbrella), and one of those laws is that you cannot pour your own drinks in a licensed facility (the hotel), but they must SELL you the liquor and POUR it for you. Bernie and Tom just about had kittens on their own at that point. Tom called, upset because Bernie had mentioned the arrangements to the hotel (don't ask, don't tell?) and he was worried we couldn't do the kiddush club. I calmed him down and told him we would work it out, just find out how much money they wanted. Barry Goodman, the border incident guy, and I were talking about what we could do. 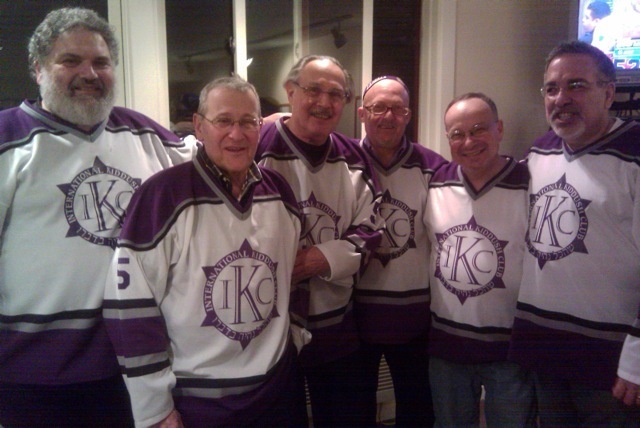 We had formed a group of 5 guys who were taking care of the kiddush club at the convention by this point; Barry and I, Larry Weiderhorn, Allan Sussman and Allan Gottesman. Tom had to keep "under the radar", since he was Convention Chairman and we were still a bit "outlaw." We came up with the idea of selling tickets before Shabbat for the drinks. (Jewish law prohibits the use of money on Shabbat) The hotel wanted $85 for a bottle of blended scotch and $75 for Canadian so we quickly figured out that if we sold $10 tickets, we could easily cover the costs and even do some fundraising. Every Jewish organization likes fundraising. Barry is a printer, I am a graphic artist so we quickly put together a card system that we could use. You bought a card that entitled you to a drink and then the bartender would give you a replacement card that announced that you were a member of the "International Kiddush Club" for the next 2 years. And since Barry was going to be printing cards, I did some artwork for "calling cards" for the five members. And to make it fun, we just used numbers. 1 of 5ths, 2 of 5ths, etc. So we advertised that we were selling the tickets and went to the convention. We ended up using the numbers as our nicknames on our convention badges to drive folks crazy. Not sure if that worked, but there were some pretty crazy people there! Wednesday morning we break out the cards. I got "1", Barry got "2", Larry got "3" Sussman got "4" and Gottesman got "5". When we sold you a ticket, we gave you one of our cards. Soon the collector instinct took over and people want the whole set of 5. It was totally wonderful silliness. People were stalking the corridors looking for the numbers they needed to make up their set. It got to the point that the FJMC Executive installation was interrupted by Larry Allen, one of our past-presidents, who stopped the proceedings looking for "2 of Fifths" because that was the one he was missing. We had a party in Tom's room on Friday night for the "select few" (those who knew where Tom's room was) and we ended up with a couple of bottles "under the table" on Saturday morning. That's how we made some of the money! On Shabbat morning, the hotel bartender arrives, puts up his little table and starts to convert cards to drinks. Works out wonderfully. On Saturday night, we subtracted the hotel charge from our collection and found that we had turned a "profit" of $1100 which we gave to Rabbi Charles Simon, the FJMC Executive Director for a pet project of his, buying tefillin for Latin American Masorti congregations that could not afford to buy them for themselves. Another tradition is born. We raised the price to $36.00 for the 2005 convention, also in Florida. We sold just as many "memberships" and raised even more money. We did give a shot glass and a lapel pin too, which we have continued to do at each FJMC convention. We also started to have a Kiddush Club Oneg Shabbat on Friday night, where the famous "Chinese Vacuum Cleaner" speech was made by Allan Gottesman. We gave Tom Sudow (6) his number in recognition of all his help and support of the IKC. We travelled to Chicago for 2007 and since I was the Convention Program Chairman, I got to plan the schedule. We raised the price to $39.27 (Gottesman and I are Maple Leafs fans and our favourite player was the Big M, Frank Mahovolich, #27). We gave a new shot glass, a pin, a card and an airline sized bottle of Irish whiskey. Friday night we were joined by Chazzanim Alberto Mizrachi, Steven Stoehr and David Propis, all of whom were totally ready on Shabbat morning. That's something we stress; IKC members are always first in the room for services. We don't want the 1% back! Numbers 7 (Mike Mills), 8 (Bob Braitman), 9 (Jeff Schulman) and 10 (Joe Swerdlow) were announced. In 2009, we had over 160 members in Philadelphia over the July 4th weekend. This time we priced the membership at $39.99 (Gretzky) and gave the shot glass, the pin, a small bottle of vodka, a card and a nylon bag to hold it all. I was the Convention Chairman this time and got to pick all the good rooms. We held the IKC meeting on the 33rd floor of the Loew's hotel and had a fantastic view of the fireworks on 3 sides. Our incoming FJMC president, Mark Berlin is originally from Louisville, Kentucky and has family in the bourbon business. They sent him 6 cases of their finest as a congratulatory gift and he graciously shared them with us. We gave out numbers 11 (Norm Kurtz), 12 (Eric Weis) and 13 (Dave Kravetz) along with names to Rabbi Simon (Rabbiov), Burt Fischman (CaptainRuachov), Steve Davidoff (Coachov) and Jerry Agrest (Eyesov). The names all end in "ov" because we now have official hockey jerseys, all with the number 5 on them and the names on the back become the wearer's number. Mine reads "ONEOV 5" or 1 of 5. Shirts and numbers are now available to the membership, check the menu to the left for the link. California was extremely successful. We raised over $7000 in 2011, with a great meeting at the convention. Since we meet now on Friday night after the end of all the programs, our programming has been pretty much tell a few stories and have a few l'chaims and then on to bed. But we added a few new things this time. This convention had a program fair, an FJMC event where clubs, regions and others display and promote events and programs that they have been doing over the past 2 years. 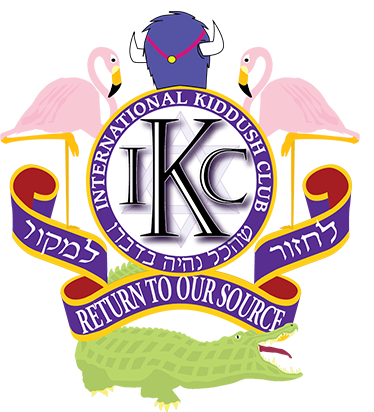 The International Kiddush Club was asked to participate, and we accepted, using the time and space to talk to those few who do not know of us. We also used the time to sell memberships and shirts to those who do. We set up our table, we gathered and compiled all of our bags and gifts and set up the gong. And each time a membership was sold, or a shirt delivered, GONG! We sold a ton of memberships, and GONGED hundreds of times. Poor Mike Greenberg, who's booth was next to ours. GONG. Eventually we took pity on Mike, and put the GONG away. It was almost time for mincha anyways, and Mike needed time to recover. Mincha, Kabbalat Shabbat and Ma'ariv were great with our friendly neighbourhood chazzanim, Alberto, Steve, Joanna and Judy giving us a great way to begin Shabbat. Dinner and some other stuff happened, and then it was time. A couple of our members had lost family members and strictly speaking as mourners, they are not supposed to attend large gatherings during their year. There are a few exceptions, and one is the attendance at study and a siyum on the conclusion of a chapter of Talmud. So if we completed a chapter, everyone there would be able to join in the siyum, and nobody would be excluded from the event. Masechet Magillah was being studied by the first minyan group at Beth David B'nai Israel Beth Am in Toronto and, planners that we are, the last few lines were all that were left to study. And if you complete the end of the chapter, you get credit for the whole chapter. Copies were made and brought to the patio for our 11:30 pm event, and before a drop was poured, out came the copies and the last few lines were read and explained. We all said kadish d'rabban and made our l'chaims. As it happens, we didn't tell our rabbi about our plans. Along with some special guests who had never been to our event, he walked out the door onto the patio as 40 people were chanting the kadish. He picked up on our plans right away, and denied prior knowledge when asked and explained that we often do things like this, surprising even him. We continued to discuss Torah, Talmud and the origins of scotch whisky well into the night. And since most of us were still on Eastern or Central time, it was a very late night. But we were all there for the opening baruch at shacarit, and some of us even helped make a special hashkama (early) minyan with the mashgiach who was saying kadish. Promises of a nice kiddush will get people to shul early, and there 10 of us were, at 7:30 am! It was pretty good, because we got to visit all the other services at the convention and didn't feel guilty about moving around. Might consider doing it again, next convention. In 2012, the FJMC had a trip to South America which included a visit to the shul in Iquitos, Peru, a town that has no road access to the outside world. Rabbi Simon and the group brought mezuzot and tefillin to the Jews there, something that many had never dreamed of owning. 2013 was another great convention with over 200 people joining the club and gathering until way, way too late. But they ALL made it to services, as they always do. We had another great group of chazzanim with us and as you can see from the YouTube videos that are scattered around this site, we all had a great time, again! 2015 Will be an incredible convention for a number of reasons. First, we're going back to our "source" in Florida, where the IKC was really formed. Second, Allan Gottesman, #5 of Fifths, will be installed as the President of the FJMC. Pretty incredible, huh? But it gets better, because Stan Greenspan has been nominated as the 1st Vice President of the FJMC and the plan is for him to become the FJMC President after Allan, at the convention in 2017. We're looking forward to making some wonderful things happen to the FJMC, bringing our "brand" of Judaism to a whole lot more people. We'll do that at the World Zionist Congress in 2015, and we'll set the stage to have it get better in the years to come. The IKC will be a part of it, and we're working with a couple of future presidents to keep things moving. You can see the 2015 logo at the top of the page, and it may give you some hints of the kinds of fun stuff that will happen. We have continued to raise funds for the Tefillin Fund, which now buys mezuzot too, and the total given to the Tefillin Fund has exceeded $40,000. The only alcohol we use IKC funds for is for the convention, all other meetings or events are hosted out of the goodness of those bringing the drinks. And the 1% I mentioned before? They like us now. They have seen the ruach we bring to the organization and they have all become members! We've had a great time doing all this and we look forward to the continuation of this tradition well into the future. The 2015 convention is in Miami and we hope to see you there.